The school is officially authorized as a capacitation entity on the following professional equestrian courses: Equestrian Science & Classical Dressage, Equine Therapy and Equine Paramedic. Our students are granted a diploma with official recognition from the government´s “Secretaría del Trabajo” at the end of each course. The course has both practical and theoretical formation allowing students to face the challenges in each of their areas of specialization. For each of our programs, we encourage the development and achievement of sufficient working skills to fulfill the specific requirements in each of the activities that involve the profile of our graduates. Our school is Co-ed. We instill a strong sense of respect and gender equality in our students. Students are graded through a weighted average system. For the Equestrian Science & Classical Dressage and Equine Therapy courses, students may initiate the course during the first week of every month. 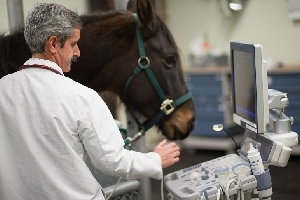 The Equine Paramedic course initiates biannually so student entry takes place on the months of January and July. The minimum age of entry is 15 years. If the student has not finished high school yet, alternative open high school programs are offered to be taken in parallel to our courses. For advanced students, we offer the possibility of joining the cast of the equestrian show that tours the country. We provide an employment program with several job offers for our graduate students within the horse community. The enrollment fee for any of our courses is of $6,000 Mexican pesos. The monthly tuition is $4,500 Mexican pesos; this cost includes the use of our horses and horse tack. Paying the course in advanced grants a 12% discount on the overall cost (enrollment fee not included). All-inclusive packages are available at a starting monthly price of $9,000 Mexican pesos for students that wish to stay in our school, they include: tuition, lodging and food (breakfast, lunch and dinner from Monday to Sunday). Three types of rooms are available: individual room (for one person), double room (for two people), and a shared suite (bunkers) for several students. All rooms have free WiFi internet, Cable HD TV, study desk, closet, and bathroom with shower; housekeeping service is included daily during morning hours. One indoor arena, two outdoor arenas, 54 stables, horse clinic with operating theater, study lounge, library, lodging, cafeteria, gardens, paddock, parking, 24 hour surveillance. The course´s academic plan integrates equestrian culture since its early stages until recent times. Our students take different equestrian topics providing them an overall knowledge of the horse’s environment. Alongside theory lessons, students take practical lessons from our professors, hence achieving a global learning. A meticulous techno-practical program concerning the correct method of horse training is offered. Our goal is to strengthen the abilities of both riders and horses to rise their capabilities and achieve outstanding performance, initiating with the three natural horse gaits: Walk, trot, and gallop. 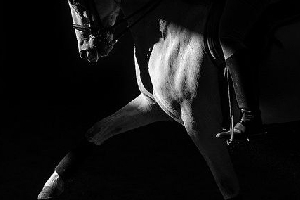 Once a perfect coordination is achieved (connection and harmony between rider and horse), a higher level teaching begins: classical dressage, requiring a higher expression of movements, rhythm, and tempo. 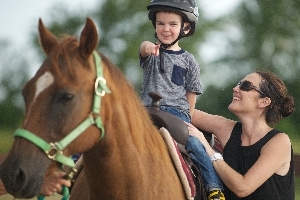 This way, riders become qualified to rightfully train horses for exhibitions and/or competitions. The program is divided in three levels, each level lasting four months, with a total duration of one year. 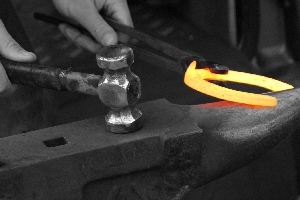 At the end of each level, the student is issued an official diploma certifying the reached level. Distinguished students are invited to participate as professional riders in our equestrian show that tours Mexico gaining extra-curricular experience. Students may bring their own horses which exempts them from the enrollment fee, also a 10% scholarship on tuition is granted when acquiring our all-inclusive package. The cost for the horse & rider program starts at $12,500 Mexican pesos per month, it includes lodging and food for the rider (breakfast, lunch and dinner), plus training and board for the horse. This program delivers exceptional results since both horse and rider strengthen their learning throughout the horse. -Junior Rider: four month period, no previous knowledge required, trains rider on basic horsemanship. 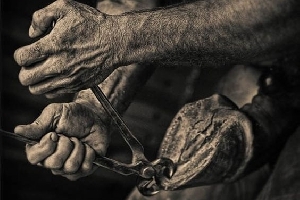 Topics: Equestrian Culture, Horse Tack, Veterinary, Horse shoeing, Equine Nutrition, Basic Horse Care, Dressage, Harness, Show jumping, Vaulting and Equine Assisted Therapy, as well as, Civism, Ethics, Human Factor, Security, and Prevention. 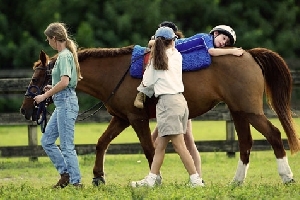 Its main objective is the training of therapists within the Equine Assisted Therapy method, to offer appropriate attention to patients requiring therapeutic assistance, with a sustainable model of attention and quality that helps the prevention and solution of health issues. A working plan is determined and it includes philosophical, theoretical, methodological, and practical elements, establishing as first priority the wellbeing of the patient. We also document the evolution and results of every patient. The program is divided in three levels, each level lasting four months, with a total duration of one year. At the end of each level, the student is issued an official diploma certifying the reached level. 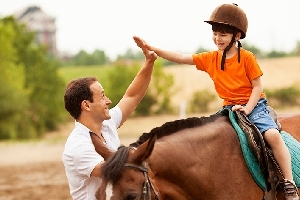 - Neuro-development: four month period, Equine Assisted therapy level required, trains therapist to treat disabled patients from age between two months and three years. 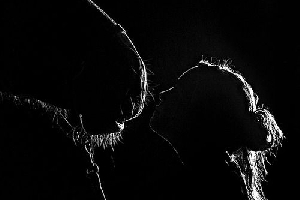 - Equine Early Stimulation: four month period, Neuro-development level required, trains therapist to stimulate babies and infants assisted with horses. Topics: History, Foundations and Principles, Methods, Users, Therapeutical Program and Session, Anatomy of the Human Being, Types of Disabilities, Equine Therapy Regulations, Horseback riding and Equine World, Neurosciences, Cognitive Functions, Emotional Intelligence, Strategies of therapy on infants, Early Childhood Intervention, Characteristics of Development. The student will receive basic knowledge and understanding to assist horses through common emergencies such as colic, fractures, cuts, bruises, just to mention a few. The goal is to form specialists in preventive medicine and emergencies, able to assist professional veterinarians. Three main subjects are taught to the students: basic horse care, first aid & emergencies and preventive medicine. 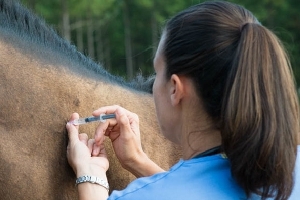 Preventive medicine diminishes risks and complications of the most common horse ailments. Basic knowledge and practice of first aid and emergencies will enable our students to stabilize the horse while a veterinarian arrives on site. The program has a total duration of 6 months. At the end of the course the student is granted an official diploma. Topics: Anatomy, Outdoor Management, Physiology, Psycho chemistry, Nutrition, Parasitology, Bacteriology, Mycology, Virology, Epidemiology, Pathology, Pharmacology, First aid techniques.